In fact, as the report explains, over 85 percent of the streams in the core forest area are designated as Exceptional Value or High Quality. This is the fourth scientific report since May to find shale development is not a major threat to the Commonwealth’s water, and the third state agency report in two weeks to show fracking has little risk of harming Pennsylvania’s environment or the health of its residents. Additionally, DCNR notes that the agency has successfully minimized forest fragmentation from shale gas infrastructure, and that shale activities have “not been impacting” other DCNR actions such as timber harvesting. 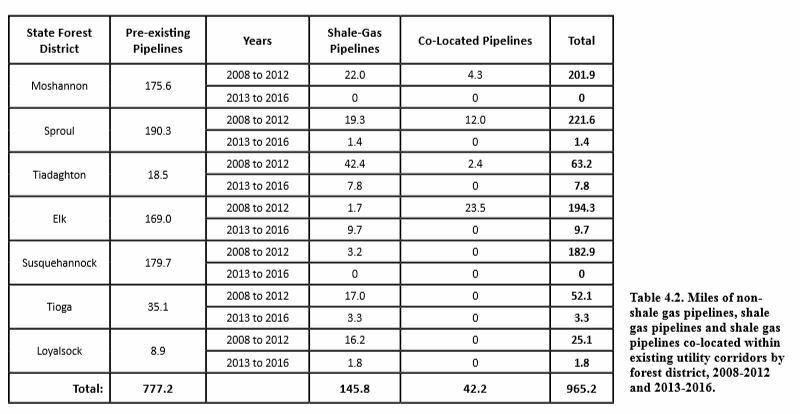 For instance, to reduce fragmentation many pipelines have been built in pre-existing utility corridors, as the following chart shows. Of the 5.26 trillion cubic feet of natural gas produced in 2016 in Pennsylvania, 9 percent (or more than 468 billion cubic feet) was from state forest lands. 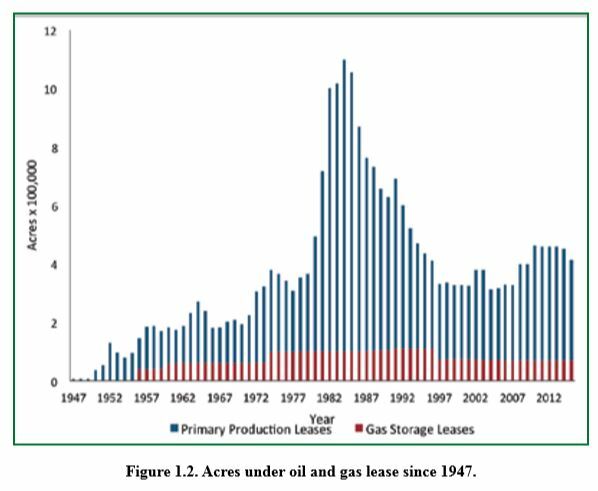 From 1947 to 2016, oil and gas activity on state forest land resulted in a cumulative income of nearly $1.2 billion. 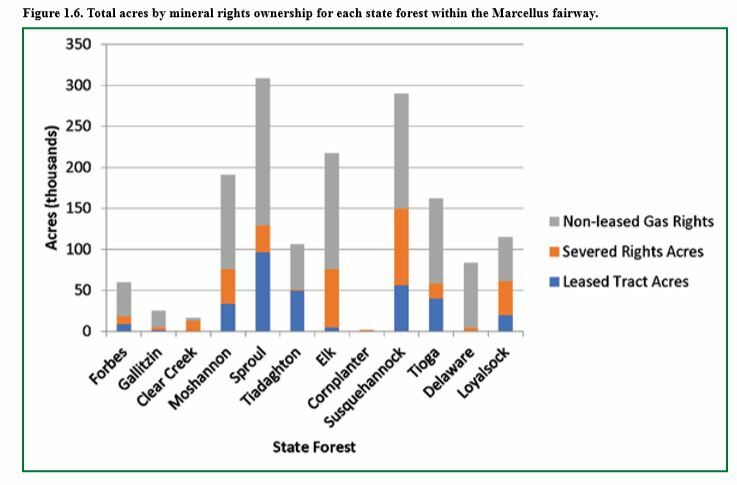 DCNR estimates that currently only 30 to 35 percent of the leased state forest tracts have been developed. Dept. of Environmental Protection (DEP) conducted 3,101 inspections of unconventional gas infrastructure on state forest lands from 2013 to 2016, resulting in 47 Notice of Violations (NOV) and 141 incidents. This is down from 324 incidents on state forest land between 2008 to 2012, resulting in 308 NOVs – a nearly 56 percent and 85 percent reduction, respectively. 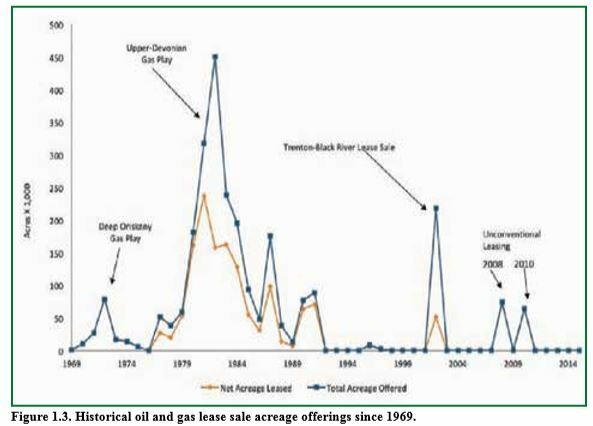 Notably, Pennsylvania state forest lands have been under a new leasing moratorium since 2015, despite a long history of leasing and resource development – 74 oil and gas leases and 2,000 wells since 1947 – on these lands. 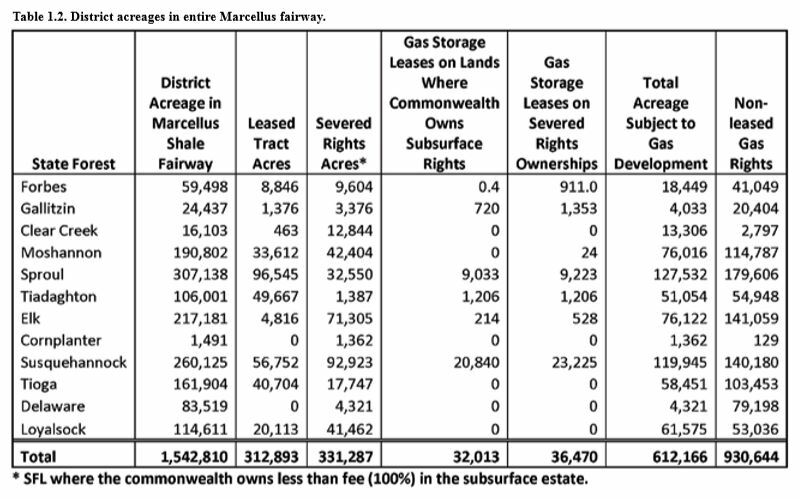 The following chart from the report explain in further detail where these 712,663 acres – a mere 46 percent of the potential development acreage – are located. The introduction of invasive species of plants to the state forests from shale activities is one area that DCNR notes needs continued monitoring. This is something the oil and gas industry takes very seriously, as the Marcellus Shale Coalition’s upcoming workshop on invasive species demonstrates. The 2018 DCNR shale monitoring report demonstrates this is still true today, and that shale development is possible on Pennsylvania’s state forest lands without being detrimental to the public or environment. Which begs the question: Why do we have a moratorium on this land?